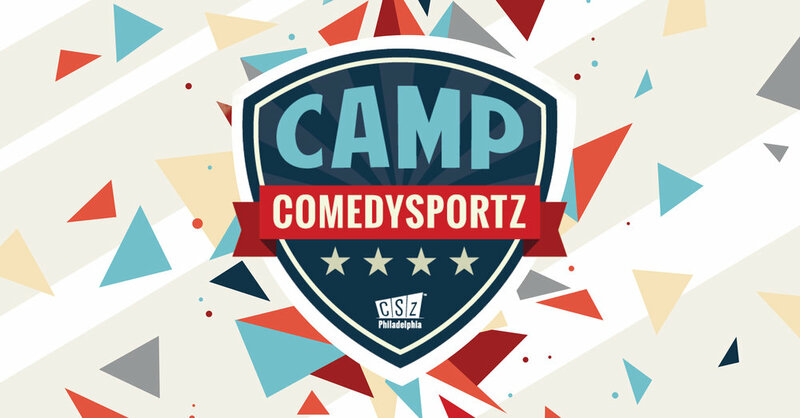 Camp ComedySportz is a fun, interactive performing arts camp where your child experiences team building, supporting friends, taking creative risks and building self confidence while they learn how to play the longest running improv comedy show in Philadelphia: ComedySportz. Camp ComedySportz takes place in our home theater at 2030 Sansom Street in the Rittenhouse section of Philadelphia. Our camp programming includes the Basics of Improv, how to “Yes, And”, Scene work, creating characters, stage presence and the introduction to ComedySportz-style game play. Our camp counsellors are all experienced teachers and improv instructors. In addition to enjoying daily games and practices with their group instructor, campers will meet with CSz Philadelphia All Star specialists every day to learn specialized skills such as puppetry and musical improv. The campers are divided into two groups, or teams, based on the grade they will be entering for the 2018 school year. At the end of the week, your child will perform in a ComedySportz match, just like the professionals, for friends and family. If you would like to apply for a Diversity Scholarship, please click here. Please note: after you enroll, you will be sent to a registration form for your child or children. If you are not sent there, click this link. SARAH LECLAIR (Camp Director) has been a Philadelphia area theatre arts educator for more than 15 years. A graduate of NYU, Sarah has won local awards for her productions, onstage and off, and has been teaching, directing, and coaching every age group from infants to seniors since. Sarah is a graduate of the CSz Education program, and has taken workshops with Kevin McDonald (KitH), David Razowsky (Second City) and many others. In addition to her work with the ComedySportz Philadelphia company (2015 to present), Sarah performs with StoryUP! Philadelphia and Roll Play: An Improvised Adventure, as well as with her duos Smotherly Love and Gerry!, both Dual Duel contenders. She is a firm believer that improv is for everybody, and it will change your life! JOSH HOLOBER-WARD has been performing and teaching improv for the last 10 years. He studied various forms of improv in DC, graduated from the University of Maryland, Baltimore County with a BFA in Acting in 2012, and has been a member of ComedySportz Philadelphia since 2015.